BREAKING: Nuclear weapon detonates over Washington BREAKING: London hit, thousands feared dead. BREAKING: Munich and Scotland hit. World leaders call for calm. Jon Keller was on a trip to Switzerland when the world ended. More than anything he wishes he hadn't ignored his wife Nadia's last message. Twenty people remain in Jon's hotel. Far from the nearest city, they wait, they survive. Then one day, the body of a girl is found. It's clear she has been murdered. Which means that someone in the hotel is a killer... As paranoia descends, Jon decides to investigate. But how far is he willing to go in pursuit of justice? And what happens if the killer doesn't want to be found? The Last begins with the end of the world as we know it (yes the R.E.M lyrics are intentional). Nuclear attacks have taken place, affecting San Francisco, Munich and Scotland. Little information about these is given, which I think adds to the authenticity of this story, as we the reader are in the same situation as the people involved, cut off from the outside world by devastation and disaster. Jon Keller is staying at a remote hotel in Switzerland as part of a conference when disaster hits. Some of his fellow conference attendees panic and flee the hotel in the hope of escape. Most are terrified at the prospect of the end of the world as they know it and are paralysed by fear into staying at the hotel. This seems like the sensible option at first. The hotel is safe, away from the major towns and cities and their chaotic evacuations as people anticipate further attacks. However the hotel is not the place that it first appears to be. When the body of a young girl is found, her identity a mystery, we realise that the hotel itself is a very mysterious thing. Historically famous for it's slightly creepy, remote location and thirteen floors, amongst other more secretive details that Jon is yet to uncover. The only thing we know for certain is that her death was not accidental, and she was not killed by the blast, fallout or radiation sickness. In short, she was murdered. Jon, as he begins to document each day since the nuclear attacks, is determined to find out who committed this crime, and whether the hotel residents are in further danger of more than 'just' another nuclear attack. 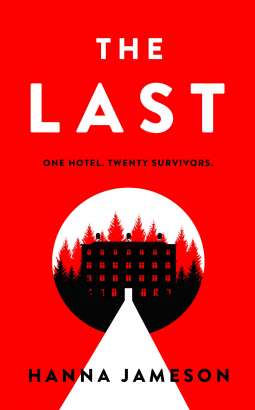 The Last is a difficult novel to summarise, is it a post apocalyptic thriller? A murder mystery? or something in between? Whatever it is, it is a great novel, with an interesting conclusion! The Last is available from 31 January 2018.